The BBC have just announced the news–Mammoth Screen have offered me a cameo in their new production of Poldark. Poldark has brought much joy to my life–I’ve often called them Poldark Perks–which doesn’t do them justice. I am delighted to be invited to play a role in the new venture which has got off to a flying start with superb scripts from Debbie Horsfield (I have just finished reading them) and a tremendous first tranche of principal casting. I am cast as Dr. Halse–the clergyman with whom Ross shares the coach on his journey home to Nampara from Truro in the opening scene of the first series. Back then, a benign figure–in the new series he comes over as rather less so! I fear I’ll be exchanging the marvelous leather coat and boots for drab, black church cloth and a sneer. Joining the Cornish establishment that Ross so despises (though he was born into it) will be a challenge! 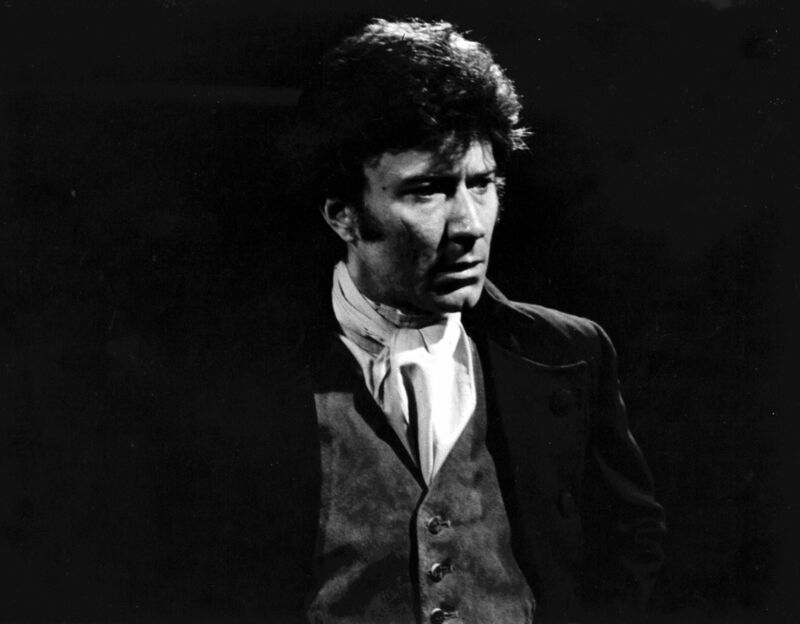 Joining the new Poldark will be exciting–but also poignant for me, bringing back many wonderful memories of 40 years ago. Not least in my mind will be fellow members of the original cast–especially those no longer with us: the beloved Angharad Rees, Ralph Bates, Richard Morant, Frank Middlemas, Paul Curran and Mary Wimbush. I’ll be there for their memory–and for the late Winston Graham–as well as for the intriguing prospect of acting with the new cast to help bring this wonderful saga to a new audience. I am so happy that a whole new generation will be able to get acquainted with this wonderful story. How wonderful. I loved the old series and all signs are for the new one being superb too. Unless they plan to pad you out considerably, you will be an extremely dashing Dr Halse. This is exciting news- everything I hear about this new production gives me confidence that it will be a wonderful production. What wonderful news for you Robin. For some reason, the first Poldark just past me by – and Mark, but we’ll certainly be watching this time. It’ll be the third ep, Jan–thanks! The third??? Gosh. What will be in 1 & 2 then – American stuff? Dear Robin,That was my wish the cameo and I’am very happy they did .That’s fantastic news, and just.Have fun on the set overthere.Big hughs, Chantal. A very clever casting and great tribute to your portrayal of Ross Poldark by opening the series with you handing over “the leather boots” to a new Poldark generation, Congratulations look forward to seeing the new series. Congratulations from Colorado! Looking forward to the new series and watching with friends and family. Wonderful stories for every generation. Every generation is right, Kathleen. How appropriate to have you appear in the opening scene! Would love to see you woven through crowd scenes through the series, but how wonderful to see you in the beginning! That is so exciting!!!!! I cannot wait (even more so now)! That’s fabulous, Robin! I can’t wait to see it and you! That’s fabulous, Robin! Can’t wait to see it and you! Just saw your comment about it being the third ep in the new series, but we all remember where it began for us 40 years ago. This is the most wonderful news ever! It seems like a miracle coming from out of the stars! Have a spectacular time and just know that all of your friends are thrilled and couldn’t be happier for you and for ourselves as well! Wow! Congrats, and how wonderful! I’m sure many memories will be reignited for you. I can’t wait to see the new version, but will always be very sentimental about the first. Well, that guarantees that I’ll enjoy at least the first episode. Congratulations to you, and to Mammoth Screen for getting you. Your cauliflower soup with smoky bacon was a huge hit at our house. I didn’t dare garnish it with florets because my son thinks he doesn’t like cauliflower, so I used a dab of light sour cream and a sprinkling of smoked paprika. He didn’t know what he was eating, but he liked it. Thanks, Catherine–happy to hear about the Cauli soup and your son! It seems as if all the thoughts and wishes of your many, many fans were winging their way into the casting area for the new series – thank goodness they listened. Even just a small role will bring back the many memories we have. I think I have watched the original, and the repeat, followed by my videos and now the DVD’s about 10 times and never tire of it. Congratulations Robin – it would be great if Donald (that gorgeous Scot) and Kevin (McNally) could be given cameos as well. What memories we would have then. Thanks Helen. Donald is heading your way! He is playing Pope Paul V1 in a play with David Suchet. Maybe you could tell him yourself how gorgeous he is! Wow!!!! Who says you can’t go home again???!!!! Congrats! We Aussies are waiting with bated breath to see the new series of Poldark and it will be a treat to see your cameo, Robin. Have fun! Brilliant, Robin! Break a leg!!! Iam so excited to see this wonderful story told again. A good story can be told over and over when the message is so wonderfully presented. Forty years is a long time but the love of this series only gets better. “Wonderful story” is right, Charlotte. PERFECT. You get to act opposite the new Ross — with the key word here being “opposite”. Halse. That’s so anti-Ross it’s almost Warleggan. 😉 Seriously, though, you’ll be brilliant, Robin. Yes, Chris–goes against the grain! My most sincere congratulations! Wonderful news. Best of luck in this new production of “Poldark”. Will await of its appearance with great anticipation. I am delighted that you will have a part!! Well deserved. Of course they arranged this, having even a modicum of sense! Maybe now I can be a little less suspicious of the new series. Black coat and white collar aside, can you sneer with the devilish glint in your eye that worked so well before? I’ll have a go, Elaine! I was so hoping that this would happen! I hope we get the series on PBS. Nothing will ever replace the original in my heart but if this new version will bring Poldark to a younger generation then I am (reluctantly!) for it. I am torn. It is thrilling that a new generation will be introduced to Poldark, but my heart is all wrapped up in the original. Your being a part of it makes everything OK. Love what you said about being there in the memory of your friends and colleagues who have left us. Congratulations! Now I’m really looking forward to the new series. I bet they thought about it–they love the books. This is great news. I remember how we absolutely sunk ourselves in the first series. What wonderful days those were! We even joined the Poldark Society – in the days before the internet – we waited for our packet to arrive each month! And the circle completes itself. How wonderful for you. I can’t wait to see it! They are, Lesley–“a disreputable, dry old stick”–sounds just up my street! Wonderful news, I can’t wait. However you will always be ‘Ross’ to us fifty something’s…! Poldark was the show to watch when I was young, I remember curling up on the sofa with my mum to watch it. I am also very happy it will live on with a new audience – and that you’ll be in it. I loved the character of Demelza and my husband thought Demelza was beautiful, so when we had our lovely daughter we named her Chloe Demelza India Coleman. We don’t usually name our children after characters but when thinking of names, it made us both smile so seemed to be the right choice. Chloe is now 15 and wants to be a writer and interestingly, she loved Being Human, so she’s very excited about the casting of the new series of Poldark. Now there will be three generations curling up on the sofa to watch the new series. Take care and enjoy filming. How fine! My daughter is also named after Demelza and is also 15!! We’ll be watching this together, I’m sure! Great, Nancy–say Hi to Demelza! SOOOOOO pleased for you Robin!!! This is what so many fans where hoping for………WHOOP WHOOP!!!! Happy lady here!!!! Congratulations Robin! It will be rather strange for those of us glued to the TV most Sundays in the mid 1970s to see you playing any other role than Ross. But it’s great that you been cast in the new Poldark. No excuse for missing the first episode now! And then there’s the book……… Making Poldark Again! Thanks for letting me know about this new Poldark Series coming. I will be eager to see it. Do keep me in the loop; I don’t want to miss even a second of it. It was my all time favorite series, and Ross Poldark one of my heroes. Thanks for mentioning the wonderous Angharad Rees. What a delight she was. Forty years ago? Can’t be!! But, it is indeed. If you hear of any schedule of showings, especially for the S. F. Bay area, where I live, I’d appreciate your letting me know. So, if you send out anymore mailings, please leave my name on your list of recipients. Also thanks for the photo. You really were a handsome fellow, and I see those features in your recent photos, too. All the best and good luck with the new series. What great news – shame they did not cast you as the father. I purchased the series last week and my daughter who is 25 is watching it with me. She absolutely loves it – I doubt the new series will come up to the original – I feel as if I have been taken back 40 years and am madly in love with Ross again. Glad your daughter is enjoying it too. Thank you for the opportunity to watch this rich and wonderful saga again; although I don’t think anything can top the original. I’m so glad that they have found a small role for you Robin. I think it’s somehow appropriate that you will be in the first scene and in sense the old will be facing the new and passing on the baton for Poldark. I very much look forward to seeing that opening scene and indeed all the rest of this new version of Poldark. I’ll be in episode 3, Ros! on April 11, 2014 at 6:59 am | Reply Shelagh in Vermont. Echoing everything said here before! and so glad they had the smarts to cast you in the new Poldark, which will make us old timers tune in when our turn comes Stateside. Hoping for lots of Cornish scenery as I had to cancel my trip next month and may not get to see the place where my family lives again. Enjoy your new role and keep the recipes coming, I adapt them frequently. Cheers, Shelagh in Vermont. Congratulations – fantastic news! I cannot wait to see the new series, but there will only ever be one Ross Poldark -Aidan has such a hard act to follow! From all that I have seen and read in the media it seems that Mammoth Productions are living up to their name and taking mammoth steps to ensure that this production is as authentic as possible. I understand that they will be filming in Corsham in early May, as I only live 30 minutes away it seems too good an opportunity to miss! I don’t suppose you will be heading Corsham way in May…..? Thanks, Sian–don’t think I’ll be in Corsham. I can´t wait to see the new episodes with you in it! Good luck and I will remember those who are no longer among us, as you gracefully have mentioned. on April 11, 2014 at 7:59 am | Reply Caroline P.
Splendid! I hope you will enjoy taking part in the new Poldark series.It’s so thankfull you can do this! I,m so happy for you. It is in this case very touching to realize that so many great players aren’t with us any more. An astute move by the producers! What a way to ensure that those of us for whom the 1970s version is THE Poldark tune in from the start – thereby hopefully being drawn in and continuing to watch the new version! I wish them well with the new version but the jury is still out for me. Will watch the opening scenes for old times’ sake anyway. Episode three it’ll be, Susan. Wonderful news, so looking forward to seeing you on screen again and I am sure we will embrace new production, always good to see a different take on a fond favourite story – and it is such a good story. I agree and the scripts do Winston proud. Hi Robin – what great news. That was a really good move by the producers – especially to cast you in a role that fans of the original series would never have contemplated you portraying ; though I would have really enjoyed seeing you as Nicholas Warleggan…!! Hopefully when they make series 2 or 3, they’ll have the sense to ask you to appear again as (say) Lord Liverpool, or another one of the politicians from the later books. Really enjoying your recipes by the way….. Thanks David and glad you are enjoying the cookbooks. Best news! Absolute devotee of the original, even visited Cornwall in 1979 just to see it in person & visited as many Poldark sights as we could find. Bought your book at a shop in Tintagel & treasure it. It will be hard to watch the new series without you as Ross – you are so much identified with him like Clarke Gable & Rhett Butler! I am sure you will enjoy being in the new series. Can’t believe that I can actually write this to you. Best wishes. Thanks, Rhonda for your good wishes. Excellent news! But if you’re in ‘the opening scene’ when Ross returns and that is in episode 3, what are they going to be doing in episodes 1 and 2?! The coach ride is not in the new series. Until I read this, I was not even tempted to watch the remake. The original version will always be “Poldark” to me. You will always be Ross and Angharad will always be Demelza. I’m glad that the producers are honoring you with a role. I will now watch, but only for that reason. If the producers are smart, they will expand your role throughout the production. Glad you’ll be watching, cpageh! It’s a wonderful gesture to someone who gave so much to the series the first time around. Congratulations and best wishes, Robin. ‘That was then’ was a joy to behold, and now we have a new glimpse of Robin Ellis in a Poldark setting, damme if ‘ee ent done well. I’m always leery of re-makes, but at least this one will be getting off to a good start with you in the opening scene. Clever of the producers to have the “real” Poldark up front in the new series, even if he is disguised. Like others, I’ll miss Angharad Rees, Frank Middlemass and Richard Morant, among others. To me you and they “are” the characters of Poldark. Will look forward to it on PBS eventually. Thanks Nancy. I am in the 3rd and 6th episodes. My description was not clear. The coach scene is not there this time. Robin, this is such wonderful news. I am so glad to hear you say that the scripts do Winston proud. We still miss him every day. All the best! Congratulations from Delaware. I am so happy for you and myself. Something wonderful to look forward to! We were just there in Delaware–Virginia–thanks! Our family will be tuned to the new production, and we have confidence that Aidan and the rest of the cast will deliver fine performances, and that the filming will be top notch. BUT……but….Robin, you were the definitive Poldark, and in many of our hearts “the only.” So glad they cast you in the new production! I’m wondering how Aidan will feel about acting with the Original……. 🙂 Who is playing Demelza? My husband was smitten with Angharad; her passing was so untimely. Thanks Bonnie. Demelza is played by a v talented young actress, Eleanor Tomlinson. Robin what wonderful news, I will be watching like all the others. As for the leather coat and boots no one could fill them Robin. Congratulations. How exciting for you and fortunate for your fans! It will be wonderful to see you once again on the “Cornish Coast” in any role. For me, however, you will always be the dashing, albeit flawed, hero…Ross Poldark. Bonne chance! I am so pleased that they have asked you to be in the Poldark. The books are still wonderful to read, often taken with me to Cornwall every year. It will be a real joy to see you back on our screens Robin, it has been too long. I think this series like the first will be well received, still think it will be hard to top the original, such a brilliant cast. I am already planning to revive my late husband’s and my favorite old “Poldark” tradition of enjoying champagne during the program . . . only now, during the second generation, my grown daughters will join me and some friends! And, the champagne will be a little better this time around! I am so glad you’ll have a part! It couldn’t really be Poldark without you! I can’t wait! This is good news! I am so excited and looking forward to watching you act again. I know you will be fabulous! Also, I am happy to hear that you like the scripts. I now have “faith” that remaking POLDARK will succeed. Congratulations, and have a marvelous time in Poldark Country. on April 11, 2014 at 7:56 pm | Reply Dianne P. YAAAYYYY!!! Can you hear us shouting from New Hampshire?? Dr. Halse and a sneer, eh? You’ll have to practice that! Seriously, though, we’re so glad you’ll be in it, Robin. Sounds like you’ve brought everyone together once again–now that “the old guard” is on board & will have a look! Oh Robin – this is truly delightful news and I can only concur with the many, many comments that you’ve already received wishing every success for this exciting new production. The mere inclusion of yourself has elevated my anticipation 100 fold! I will so miss the iconic original cast but having you there is connecting the past to the future and back, giving a brilliant validation to the new Poldark. And thank you for re-introducing me to the magic of cauliflower – I am now completely addicted to “Helen’s Spicy Cauliflower” dish! Thanks, Lana and I shall let Helen know about your addiction! What an intelligent decision to have cast you in the new production, guarantees great viewing figures from us ol’ devotees. The comparison to the original is inevitable, and the former fab cast, but a great story is exactly that. Each time I go to Cornwall I have to walk by Nampara in Botallack, it makes Poldark so real as do so many of the fab locations that were used. How marvellous for you to be in this new version, no scar I presume. I remember walking past you several times in Fulham in the 80’s and checking you out for that scar! Enjoy your new role, can’t wait to see it. Brilliantly cool and tremendously perfect, Robin! We’ll watch you from Italy! Greetings from Nebraska! I’m thrilled that you’re going to be in the new series. I fell in love with Cornwall (and Ross!) as a teenager and still hope to visit it one day. Hope you can keep updating us with your experiences on the new series. It will be a treat to see you in the new production. Any chance you can work in your line about ‘not knowing the half of it’? Congratulations to you! Hi Betsy and thanks–believe me it has crossed my mind (about “the half of it” line) ! Thanks Randi–ca va over there in the windy city?! I had mixed feelings when I read about the new version of Poldark. The original series was so wonderful , and so brilliantly cast , that I thought it couldn’t be bettered and why didn’t they just repeat it rather than make a new one? I love reading the Poldark novels , I read them every few years and watch the dvd’s every year , just to get my fix of Ross, Demelza, Prudie and Judd ! I have watched your career since first seeing you in Elizabeth R as a teenager and enjoyed your performance in the brilliant Blue Remembered Hills and now I am writing to you via e-mail , who would have thought that possible forty years ago! I really enjoy reading your blog and the comments left by other fans. Thanks for taking the time to read this. Thanks Heather for your good wishes and hello! Awesome news Robin! How wonderful that they invited you to be a part of it. I can’t imagine how many memories this will bring back to you. I live in United States and loved Poldark! I watched the series again last year and fell in love all over again. I can’t wait to see the new version. Congratulations and most of all, have fun! Thoroughly enjoyed the original Poldark series with such a memorable cast – one I think it would be very hard to beat. I too had hoped it would be repeated. Whilst I had been planning to watch the new version and was interested to see the new casting choices, the fact that you have agreed to join the cast and ‘hand the baton on’ so to speak is wonderful news . Cant wait for 2015! Thanks P-J–I’m looking forward to it too! Am sure you’ll have fun and do great in the role and your presence will only add to the interest and excitement of this new version. I know I’m excited to see it! Excellent news, Robin. Look forward to the new series, with you in it. We will always have the original Poldark. Thanks. Siiiiiiiiiiii! Evviva!!!! Hip Hip hooray! I am very happy for you Robin and I hope to watch the series also here in Italy. This time I cannot wait 40 years to see the end….Congratulazioni, Robin! So ambivalent about this new version (‘cos I loved yours), but very happy that you will have a part in it! I am in America and just saw this new Poldark on IMDB. I loved your Poldark so much I saw each episode multiple times when it aired in the USA in the seventies on BBC and I purchased the DVDs which I cherish. If this series comes to America (maybe on Netflix or BBC America) I will find it difficult to compare anyone else to Ross. You were one of a kind and I wish you the best in the new Poldark. Thanks, Maryann–the new adaptation is due in the States on PBS in June.